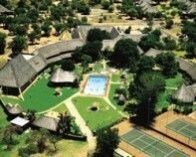 Just 35 kilometres from Brits in the North West Province, is a Bushveld resort divided into 13 camps. There are 9 swimming pools, barbeque and entertainment facilities. These facilities include squash, tennis, swimming, horse riding and a sauna. Game watching expeditions from an open vehicle are arranged for the wild life spectator. Dikhololo is a lush green wonderland set among some beautiful natural rock formations, and it offers city-dwellers a quiet sanctuary with all the comforts and convenience they are accustomed to. No TV sets in std. chalets/ hire from reception.